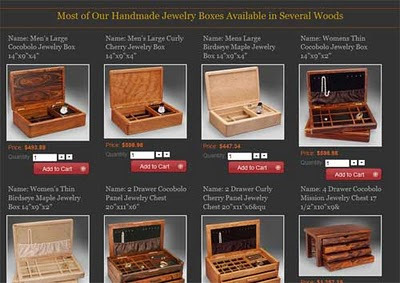 To create your product grid you will need to first setup k2mart custom listing overrides. Once that is done create a new mod_k2_content module item and add it to your template. My grid is fairly large so it goes in the "bottom" position under the content. Change the "Select sub-template" to your new custom override directory. !important: Before saving your module, make sure to enable k2 plugins under advanced in the module. Or k2mart will not load. Now that your module is all setup we can make grid changes. Open up Template/html/mod_k2_content/CUSTOM_OVERRIDE/default.php file to alter the default list behavior. In this file you will find that the k2 items are setup in an HTML list. Add a class of "productGrid" to the UL and "boxItem" to the LI. Now go adjust your template style sheets to get the list items to behave as a grid. I wanted all of my k2 items in a box format to fit 4 items per row. To do this I made each list item a block with a width and padding to ensure they would fit in 980px. Now we have a grid of our products but the k2 mart product boxes are ugly. Lets go fix that too. Change the module.php k2mart class from class="itemVmFields" to class="itemGrid". To get my desired look of Product Name, then Image, then Price, I copied over the image display from the mod_k2_content file. As you can see I removed the LI item for the product name and put it into an h4 tag before the image. Of course then I played with buttons and text styles, but hey its a start. I installed k2mart on site. its working fine. but i want to add some extra fields. i added it on extra fields groups. i select dropdown fror values. but it shows only first value. on product.